The Law Offices of Jon D. Rigney, A.P.C. has over 25 years of experience representing litigants in all aspects of family law, including domestic violence restraining orders, in addition to divorce, paternity, legal separation and child custody cases with domestic violence as a component. The information set forth below is presented to give a general overview of the law and is not intended to be legal advice for any specific case. If you have questions about domestic violence as it relates to your case, please call our office at 619-236-0533 for a live, no obligation conversation with a paralegal or attorney about the specific facts of your case. If you believe you are in immediate physical danger call 911. You will also find additional links to law enforcement and local resources for victims of domestic violence at the bottom of this page. Under California law, actions and behavior which constitute domestic violence can range from unwanted harassing texts, emails or telephone calls to physical threats or actual physical harm. Because many people erroneously believe that domestic violence requires a physical attack, victims of domestic violence often do not understand that an act or acts of domestic violence have been perpetrated on them. It is also a common phenomenon for people who are in a relationship where domestic violence is a regular occurrence to minimize the behavior of their abuser and blame themselves for the abusive behavior of their partner. If your partner places you in actual fear for your physical safety, that is the best indicator that you have been victimized. Any threat against your physical safety is always domestic violence, whether or not the perpetrator is present or sending threats through phone calls or other electronic means. A single act of domestic violence is enough for a judge to grant a request for a domestic violence restraining order. This might be as simple as a credible threat which places the victim in reasonable fear of their physical health or safety. Emergency domestic violence restraining orders can be obtained without advance notice to the perpetrator and can be obtained the same day that the court documents have been prepared. Why Should You Get A Domestic Violence Restraining Order? Domestic violence restraining orders are powerful legal instruments under California law. San Diego County law enforcement agencies and law enforcement agencies in other jurisdictions in California have zero tolerance for domestic violence. Once you obtain a domestic violence restraining order in California it will immediately be disseminated to all law enforcement officers in California via the California Law Enforcement Electronic Telecommunications System (CLETS). This means that any officer on patrol in the state can access and verify the information from their vehicle, indicating that you have a restraining order protecting you and the name and information regarding the person against whom you are protected. Any violation of an existing order can be charged as a felony and will likely result, at the very least, in the arrest of the offender. Whether or not you are married to your partner, a domestic violence restraining order can be a basis for immediate removal of your spouse or partner from your home, for orders protecting your children and financial assistance from the restrained person, if appropriate and necessary. If a California family law judge determines that a parent has been a perpetrator of domestic violence, the law requires that such a determination be taken into account when making child custody and visitation orders for that parent and their child or children. In addition, if you are a victim of domestic violence and your children are repeatedly exposed to that behavior, failure to take action to protect your children can result in negative consequences. More information about court orders for custody and visitation can be found on our Child Custody and Visitation page. Have You Been Unjustly Accused Of Domestic Violence? The California Domestic Violence Prevention Act is designed to protect victims from their abusers. Unfortunately, as with any law, it is subject to abuse. Sometimes this abuse presents as false accusations of domestic violence in order to obtain an advantage in a child custody, divorce or legal separation proceeding. In other cases, the abuser will actually attempt to falsely claim that they are the victim. If you find yourself subject to such accusations, you should seek legal advice immediately. 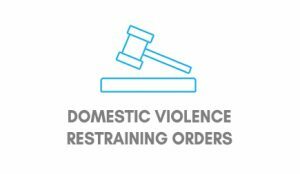 Having a domestic violence restraining order entered against you unjustly can have significant negative consequences for your relationship with your children, future employment prospects and your reputation in the community. Please call us at 619-236-0533 for a live, no obligation conversation with a paralegal or attorney about the specific facts of your case.